What is the FDA hiding? "The FDA's failure to require labeling of genetically altered foods is effectively restricting Americans from exercising this right and subjects individuals to foods they have sound…reasons to avoid. FDA policy thus appears to violate the First Amendment of the Constitution….the Food, Drug, and Cosmetic Act, which requires that added substances to food be labeled…and mandates disclosure of material facts." - Alliance for Bio-integrity Statement - in a lawsuit filed against the FDA by 9 scientists and 12 religious leaders. Six years ago, Americans began eating genetically engineered food. Surprised? That's because no one told you. While other countries require mandatory labeling of these food ingredients, our FDA has decided we don't need to know. A genetically modified organism (GMO) is created by means that overcome natural boundaries. Combining genes from different organisms is known as recombinant DNA technology, and the resulting organism is said to be "genetically modified," "genetically engineered," or "transgenic." GM products (current or in the pipeline) include medicines and vaccines, foods and food ingredients, feeds, and fibers. Why are companies spending billions on this crazy idea? Because they want to own copyrights on a genes that no one else 'owns' - so that they can make billions of dollars from them. In 2003, about 167 million acres (67.7 million hectares) grown by 7 million farmers in 18 countries were planted with transgenic crops, the principal ones being herbicide- and insecticide-resistant soybeans, corn, cotton, and canola. In 2003, countries that grew 99% of the global transgenic crops were the United States (63%), Argentina (21%), Canada (6%), Brazil (4%), and China (4%), and South Africa (1%). Although growth is expected to plateau in industrialized countries, it is increasing in developing countries. The next decade will see exponential progress in GM product development as researchers gain increasing and unprecedented access to genomic resources that are applicable to organisms beyond the scope of individual projects. 1. Pesticides are now going to be INSIDE the food you eat! 2. The lifespan of ladybugs (ladybirds) was reduced to half when they ate aphids that had fed on genetically altered potatoes in Scotland, according to a London Times article (10/22/97) by Science Editor, Nigel Hawkes. The ladybugs also laid fewer eggs. Note that the ladybirds did not even eat the genetically modified food directly, as we are doing now. They ate something ELSE that had eaten the GMOs. The danger lived on in the food chain. For more information. 3. A recent TV Show by PBS (Public Broadcasting) on GMO's showed how people have now created salmon that is several times bigger than normal salmon, and grows faster. Thankfully, these salmon are currently being farmed inland. However, to save a few dollars the salmon farm is currently seeking permission to farm the salmon in fenced off sections of the ocean. The problem is that if even a couple get away, they could cause the extinction of salmon, because wild salmon prefer the larger salmon because they assume they are better mates, and the resulting offspring have much less chance (if any) of surviving and reproducing. 4. The danger to many humans who are allergic to certain foods is guaranteed, because no one will know what they are eating. For example, say someone is deathly allergic to peanuts. A GMO may have a gene from a peanut in them. The allergic person could get a reaction from eating ANYTHING that contained the peanut gene. They wouldn't even know what caused it - because there are no labelling laws about GMOs. 5. An article in Spectrum Magazine described a Polish experiment which showed that mice definitely prefer non GMO food to GMO food. And when forced to eat GMO food, the mice began to display bizarre behavioral characteristics. The sad thing is that we don't even need GMOs to produce more food. There is already 2-4 times enough food on the planet to feed everyone. And if people want to grow food in their own area, the methods described in the book, "Secrets of the Soil" will give them the nutritional abundance they seek. But multinational chemical companies with billions of dollars to lose don't want you to know this. A Monsanto official told the New York Times, October 25, 1998, that the corporation should not have to take responsibility for the safety of its food products. "Monsanto should not have to vouch for the safety of biotech food," said Phil Angell, Monsanto's director of corporate communications. "Our interest is in selling as much of it as possible. Assuring its safety is the FDA's job." Oddly though, the FDA only requests of firms that they conduct their own tests of new GM products in what Vice President Quale back in 1992 referred to as a "regulatory relief program." The FDA makes no review of those tests unless voluntarily requested by the company producing the product. Here's yet another example of our FDA watching out for us... In 1994, the FDA approved Monsanto's rBGH, a genetically produced growth hormone, for injection into dairy cows – even though scientists warned the resulting increase of IGF-1 (a potent chemical hormone) is linked to 400-500% higher risks of human breast, prostrate, and colon cancer. Personal opinion: The silent introduction of GMOs into our world is probably the most diabolical crime against Americans, and the people of this planet, the world of man has ever seen. Our government's elite have clearly made it known that we no longer have any power or influence in the matters of our own lives. They have decided to force feed me Genetically Altered food, poison drugs, and toxic chemicals. Then they give me a the "Western Medicine" model which almost certainly guarantees me no chance of healing. Please learn all you can on this incredible threat to life as we know it, and do your bit to stop it. Once the genie is out of the bag, their is no putting it back in!!! The following web sites offer basic information on GM crops and technologies as well as ethical issues and provide up-to-date information on new developments and controversies. And now we have Genetically Modified Trees! "GE trees are the greatest threat to the world's forests and forest-dwelling indigenous peoples since the invention of the chainsaw"
The AgNIC gateway is an information resource for researchers, information specialists, educators, and members of the public and functions as a guide to quality agricultural biotechnology information. A good resource for news stories from many sources. Offers resources to support the environmentally responsible use of agbiotech products. Includes documents and searchable databases and covers worldwide development, testing, and regulatory review of GM organisms. (1) Discovery documents from the lawsuit against the FDA, Alliance for Bio-Integrity et al v. Shalala, May1998. Center for Food Safety, 666 Pennsylvania Ave SE, Washington, DC 202-547-9359. Now more than ever, we need to be aggressive with own health. EVERYTHING that goes into your body is important. Here are a few easy easy to to become proactive with your health. Prevention is worth a lifetime of health and vitality. 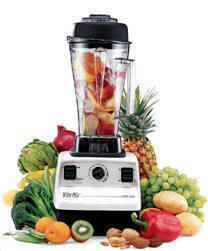 This Unbelievable Whole food Blender/Juicer Does it ALL! The choice of nutritionists & homeopaths everywhere. Get whole food juice AND fiber! The absolute easiest way to add Whole Foods to your daily diet. 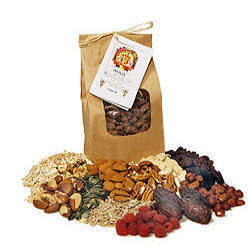 Specializing in snack and meal replacement. Amazing 4 in 1 Daily Supplement. Highest ORAC Score available. Recently added to the PDR. There is simply no better supplement available! 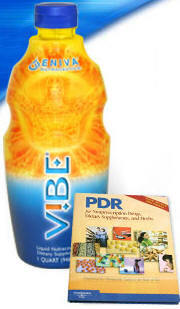 Structure, Oxygenate, & Energize Your Own Water! You think our food is bad... our water is an absolute disaster! True health starts with your diet. If you find that you simply can not get the recommended amount and diversity of whole food fruits and vegetables in your diet, Eniva's VIBE is an absolute must! Please feel free to browse this page and email with any questions. Whole food... the ONLY food designed for our bodies.